Over the last couple of months I have been allowed glimpses of how this fascinating organism works. It lies between family and community and there is nothing nuclear about it at all. By rights, our landlord should be living in the house we rent – it is the Herdade/manor farm/chief farm of the family. It was built fifteen years ago for the alpha male of the family Jose – or Ze as he is known – as is the custom when the previous alpha male, his father, retires from the main business and passes it to his first-born son. Due to some family unpleasantness from an uncle – who said he had been robbed – he did not live here for long and chose to live in another village about five kilometers away and rented out this house. His saints name plaque is still mounted on the front wall by the door. His parents still live in their house across the field. This is the lady who bakes our bread and who owns the house and garden by the waterfall. Helena not only bakes our bread at the weekend, she bakes it along with approximately 200 other loaves which are either sold or used to feed her considerable family. She regularly feeds 20 people every day – family, extended family and honorary family and workers if some have been hired to help at busy times. She also supervises what is grown in the gardens both here and at the house by the waterfall. Her father is still alive – he is the man who built and maintains the access we used to get to the waterfall – when he is not doing that he is making bamboo baskets like the one we have been given below. This one is specifically for logs, is made from bamboo grown by them and in his own words “keeps him out of trouble.” He is not young and fit anymore and can no longer shift stones and concrete without help – so he taught himself to make baskets – the workmanship is remarkable for an elderly man with failing everything – including eyesight. Their son, our landlord, runs the farming side of the business, around five hundred cattle, not counting the calves still being weaned. Here he is in action – lifting a five bar iron gate as if it was a plank of wood to block the cattle escaping after TB testing. His wife is in charge of paperwork – including our rental and all the records for the ministry of agriculture here. Various nephews and nieces all work in some way in the family businesses – be it helping with the cattle roundup for testing, tending the gardens, and helping in the kitchen. Older family members also chip in where they can by preparing vegetables, special feeds for the animals, making dough for the bread and gardening when they can. The children also help where they can. Not one person is idle and not one person is neglected or left out on their own. Everyone is cared for. Knowledge and skills are shared up and down the chain, ancient skills and knowledge are passed down, new modern-day skills are passed up. They give to the wider community on a similar scale. The provision of safe access to the waterfall – stepping in when irrigation pumps break down or the canal runs dry, the loan of farming equipment, endless supplies of fruit and vegetables to their neighbors and to restaurants who regularly provide free meals and to the fire and ambulance workers. Helena has offered us any of the plants we would like from her garden by the waterfall – we can take plants or cuttings when we need. Ze’s father has offered us the patch of land behind the house so we can have our own garden and orchard and will dig it over and prepare it for us one the main farming season is over. We have free water for the house and for irrigation from their well – also for the pool. Most of the older generation cannot read or write more than “making their mark” but are wise in a way it is difficult to comprehend – Ze’s generation has basic literacy and numeracy skills, the up and coming younger generation is catching them up and overtaking them in both and of course are far more technologically adept. They are hard-working industrious no-nonsense people who see and speak as they find – they are the salt of the earth and they are the most kind and generous people you would wish to find. There is a justifiable quiet unspoken pride in all members of the family that comes from hard work, providing for one’s self and for others. Their whole philosophy appears to be based on “enough.” Enough to meet their needs, and those of others around them, enough to stop them claiming or needing to claim from the state, enough to ensure the generation coming next learns the virtues of hard work and applies that to the modern world. It is no surprise given the above that whole villages and towns come to a standstill when one of the older generation passes on – everybody knows them and has some reason to thank them and pay their respects to them when they die. Funeral corteges in this part of Portugal are often over two miles long. There are thousands of such families in rural Portugal – they are the backbone of the country – they keep the country going. I am humbled and honored to have been accepted into this one. I hope I can live up to their example. This is a wonderful portrait of a family. It also screams for faces to put with the descriptions. I’m sure if you felt you were able to get photos of the people, you would have — so if you can, in the future, I hope you will share their faces with us! SMILE! I’m curious about how much the government is involved in these family farms. Are they taxed? Are there any subsidies? As the “backbone of the country” does that mean they are the main form of revenue for the State? I am hoping I will be allowed to photograph them in time. Ze had no problems with me taking pictures at a distance – I think the rest of the family may need a little persuading – I think if I can catch Helene making bread – I have been told I can watch that , have also been told I can visit her in her garden she will be more amenable to having her picture taken that way, than as a portrait per se. They will be taxed as an entrepreneurs/self employed – they will pay their taxes quarterly like I do. Depending on their exact activity they may receive a subsidy for a certain crop from the EU. Farming of animals is quite highly regulated – bi annual testing for TB and other cattle diseases – each birth and death has to be registered and each animal has its own ID/registration number. The backbone of the country in their case is the amount of social welfare that they save the state. Yes the elderly generation will receive the minimum pension – and it really is minimum – the rest of their needs are met by the family. There also provide all the child care that might be provided outside of the family unit in the UK or USA – there is no state provision of child care in Portugal. They do not farm their elderly off to old peoples institutions they are looked after at home unless it is something very severe. I would love to see their faces. I know farm people tend to not like being photographed. They prefer a quiet and simpler life. It may take a long while to get them to sit for you, but I hope they do formally sit and let you capture the wisdom on their faces. I am curious how you can repay their familial kindness and generosity that has been spent on you. 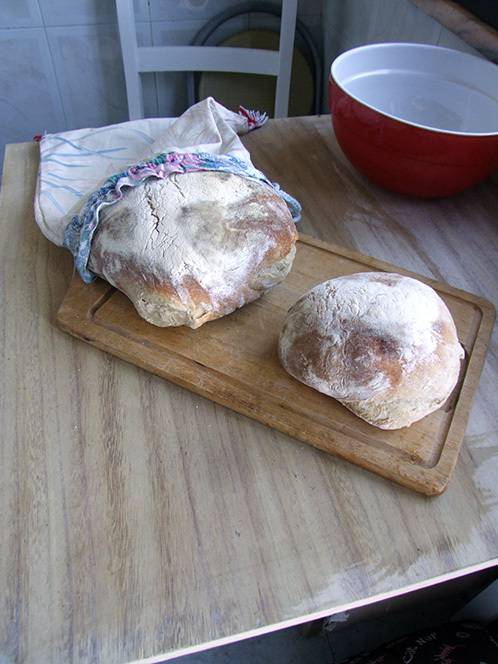 You really can’t make bread and give that back because it won’t match what was given to you in taste and history and quality and some rural families view reciprocity as an insult… as if you feel you owe them and must give back in kind in some way… what is the proper culture and custom? You can’t give them land to farm as a garden — as they have you — and share the fruits of your garden with them because that doesn’t really help them much since they’re already covered. Is there an expectation of you to respond, or do they prefer you do not? Is there a similar expectation for Mr P — or is the response cross-cultural? What would be best is a family wedding – that would be a gold mine – SMILE – but I will take any opportunity I can get! Not sure how and what with we will repay them – my guess will be with flowers and produce they do not have and do not make – my thoughts are jams and herb jellies for starters and maybe some other English curiosities. We already act as eyes and ears for them as far as the cattle are concerned – we also switch the irrigation pumps on and off when they forget , and let them use our electricity supply when they use power tools to mend their machinery in the field. Today we found an injured cow and told them, we also reported the two bulls having a fight and who had to be separated before they injured each other. The only expectation they have is that we love their house and look after it like they would, they expressed delight in our love of the house and expressed hopes that we would get it back up and running how they wanted it to be. That particular expectation would be for anyone who lived here. Mr P lends out his tractor , helps with fencing, keeps an eye on the irrigation systems – we can hear when something is not right as the pump house for them is at the rear of the house. Just like them we do what we can, when we can and at the end of the day that is all anyone can do. Ah, yes! Repay them all with their very own Christmas Cake! SMILE! Yes, that’s smart to play up your English creative gifts. That’s something that can both please and surprise them. It must be great to be made to feel so welcome as part of the whole. Is private land ownership allowed in Portugal? Can a private person own both the land and the water and the “air rights” or does some part of it remain in control of the State? Now there is a plan ………. I could get away with fruit cake ……… it is far enough removed from bread. Yes to private land ownership and yes to owning water under your land – most farms like this put down bore holes to provide water which is supplemented by the Area Irrigation system from the dams to the canals …….. that reminds me a post to come on that after I have visited the dam. Even our small cottage we lived in before here had its own borehole for water. Not sure about air rights – will have to look into that one. Yes! A proper English fruit cake would be so much fun! Do you have to filter your pump water? Or do you just boil it if you’re drinking it? At the moment we drink bottled water here or boil it for tea and coffee – we are looking at UV filters – have not come to a decision over them yet. I appreciate the peek into the lives of this family. Once again, very nice writing on your part. What a wonderful life you have there.